Learning English can open many doors for you whether it is furthering your education by going for more school or new job opportunities. The British Council, Sri Lanka offers many courses that help school children and young adults to study and learn the English language. They also help with understanding English grammar, pronunciation, and to expand your English vocabulary. They also have classes for IELTS Preparation. 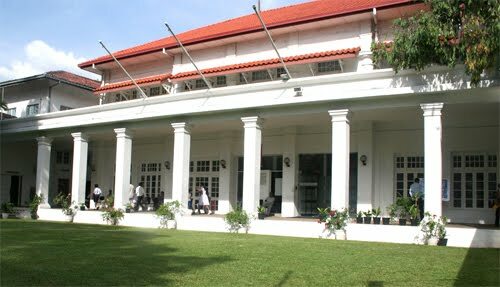 The British Council, Sri Lanka teaches students 16 years and over with a variety of levels, ranging from Elementary to Advanced. The general English classes progress through levels so students are able to begin where they feel comfortable and move up through the levels as their abilities advance. At the Beginners level courses concentrate on the basics, which include the alphabet, numbers, and vocabulary used in every day. Basic grammar is also introduced as well as reading and writing skills. There is only one Beginner level. The Elementary level concentrates on the basics for communicating in spoken English in a limited range for everyday activities. Writing and understanding short simple texts are also taught. Some of the main course objectives are being able to use a phone to find out basic information and to make simple arrangements, to get simple travel information, and to write short basic descriptions of events. There are three Elementary levels. Pre-Intermediate focuses on building confidence in communication for common situations and the ability to exchange ideas, as well as to understand and write a range of everyday texts. Intermediate levels focus on conversation and being able to communicate in more demanding situations and being able to understand more complex texts. Upper-Intermediate levels are concerned with independent communications and fluency as well as understanding realistic texts and abstract and complex ideas in both writing and speech. Pre-Advanced works on developing the ability to communicate independently and focuses on grammar and vocabulary skills. Advanced classes work on being more flexible and confident with communicating in work, school, and social situations. As well as improving further upon reading, writing, speaking, and text abilities. The British Council, Sri Lanka uses internationally-acclaimed textbooks and supplementary materials that suit each students individual needs, they also provide teachers with computers, video and audio capabilities to help individuals learn. Each student is assessed on their participation, speaking performance, writing, and grammar. Students just need to register for classes, pay their fees, and take a placement test in order to begin their course work. Cost varies depending on the level of course work taken. Other English coursework offered by the British Council includes, General English, English for Further Studies, Better Spoken English, IELTS Preparation, Young Learners, and English for Teachers. Whether you are learning English to further your education, for personal reasons, or to improve future career goals the British Council can help with learning the basics of English like alphabet and basic grammar, to being able to understand complex written and spoken ideas. I need join to your class.